The value of a Hon. George Brown, 1818-1880 - 5 cents 1968 stamp depends on several factors such as quality and wear, supply and demand, rarity, finish and more. Values in the section are based on the market, trends, auctions and recognized books, publications and catalogs. This section also includes information on errors and varieties and characteristics. George Brown, one of Canada's Fathers of Confederation, was a man imposing in stature and courageous in the causes for which he campaigned. His detestation of the institution of slavery and his support of humanitarian principles makes the commemoration of the 150th Anniversary of the year of his birth singularly appropriate during the International Year For Human Rights. George Brown was born on November 29, 1818 at Alloa, a seaport on the tidal Fourth, some 35 miles from Edinburgh, Scotland. The completion of his education at the Edinburgh Southern Academy brought from a staff member a forecast of the energetic and distinguished career to come: "This young man is not only endowed with high enthusiasm, but possesses the faculty of creating enthusiasm in others". It was not until 1838 that Brown accompanied his father in traversing the Atlantic to seek a new life in North America; in New York, father and son turned to Journalism and eventually to the establishment of the British Chronicle. In 1843 a dissatisfaction with surroundings again led to a move, this time to Canada where Brown the younger was destined to have a profound influence in politics and the emergence of Canada as a nation. Shortly after their arrival in Toronto, the Browns established a weekly publication The Banner and in 1844 Brown the younger was instrument in founding The Globe which, under the guiding hand of the future Father of Confederation, quickly emerged from the status of a weekly to that of a daily newspaper. For 36 years, Brown was undoubtedly the leading influence in the development of a newspaper which was to gain a particular status in the annals of Canadian journalism. 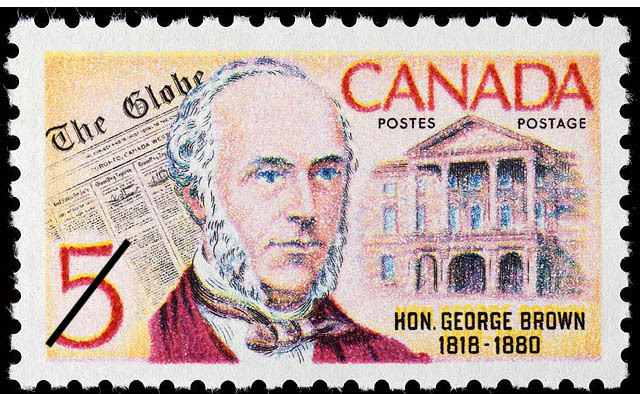 George Brown was an untiring worker in the cause of responsible Government; he advocated union with Canada of the vast and fertile plains west from Upper Canada to the Rockies, and it is recognized that the Northwest Territories were acquired by Canada largely on a result of his persistent efforts. He first entered Parliament in 1851; it is, however, an ironic fact of history that he never gained election after Confederation in 1867. He had earlier played prominent roles in the Quebec and Charlottetown Conferences. Elevation to a seat in the Canadian Senate came in 1873 and in 1874 he was appointed joint plenipotentiary to the United States. He later declined offers of a knighthood and he also declined appointment as lieutenant governor of Ontario. Historians give us a measure of this man in their reports of his political activities. Recognized as a long-time chief adversary of John A. Macdonald, later to be Sir John A. and Canada's first Prime Minister, George Brown provided a remarkable examply of "country before self". In 1864, to break a political deadlock, he joined forces with his political for Macdonald, and thereby assisted in paving the way for the eventual negotiation of the terms of Confederation. George Brown's life ended on a tragic note in death from a wound inflicted by a disgruntled worker who paid for his act on the gallows. Seated in his private office on the afternoon of the 25th March 1880, Brown had been confronted by a man who demanded a signature to a paper acknowledging years of satisfactory service in the newspaper office. Although the assailant had been unknown to Brown, it was later established he had been employed in the engine room of the Globe, and had been discharged for intemperance. A pistol carried by the assailant discharged during a scuffle wounding brown in the thigh. The injury had not been considered to be of sufficient seriousness to endanger, Brown's life; weeks were to pass before complications resulted in death on May 10, 1880.